On a frigid winter morning in St. Petersburg, Russia 1917, eighteen year old Olga Von Eggert must leave her country and family. The Bolshevik army is on a mission to destroy all aristocrats. When Olga fails to join her entourage at the designated rendezvous, Prima Ballerina Mathilda Kschessinska notifies the Khan of Kiva, a mutual acquaintance. The Khan’s son, Prince Razek Bek Khadjieff, defies his father’s orders and sends his strongest Cossack soldier to save the young Baroness. Nearly ninety years later, Damian Tolbert, a Frenchman living in Paris bids $100,000 on an antique diary with the initials NV on the leather cover. Once the journal is translated from Russian to French Damian is determined to find the rightful heir to this antique keepsake. Several years later, by coincidence, or perhaps fate, Damian discovers Anastasia Sullivan, the only living descendent to the journal, in an odd town called Lebanon, Ohio. Rather than answers, Damian finds more missing pieces to his puzzle. Will the “Mind Marauders ” finally leave his psyche? And, who is this mysterious artist, Anastasia Sullivan? This historical novel is inspired by true events of the author’s grandmother, Olga Von Eggert Khadjieff. You Owe Me One spans hundreds of years and follows several characters that are trying to save their souls. What was the inspiration for the setup to this intriguing novel? 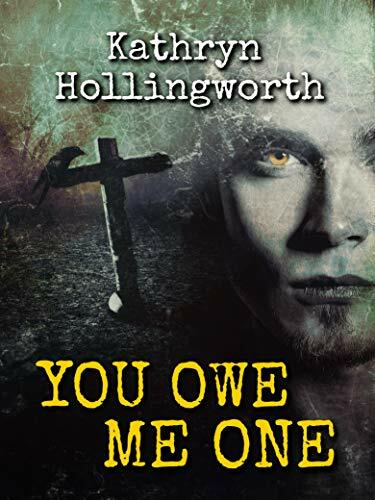 Initially I wrote You Owe Me One as a short story, which focuses upon Joe Durrant. Then I began to ask myself how Joe had first encountered the Devil. I thought of the idea of having an antique mirror as a portal and then the character of Charles came into my head. Charles became very real to me and I enjoyed writing about him and his struggles. He was a very modern man, living in an outdated and prejudiced society. I have been to Paris on many occasions, so my inspiration for his travels was inspired by my visits there. There were several well developed characters in this story. Who was your favorite to write for? My favorite character is Joe. Although he is impulsive, reckless and quick-tempered, he is strong, brave and immensely kind. He gains maturity in the novel and is always concerned about the welfare of others. These qualities enable him to stand up to Satan. This is a thought provoking novel that questions Christian ideals. What were some themes that were important for you to explore? The intention of the novel was to explore the choice between good and evil, rather than to question Christian ideals. Some of the characters are Christians and the tragic events they experience lead them to question their faith. Others, like Desire and Chantelle, have high moral values, but are logical and have no spiritual beliefs. I wanted to represent people with different opinions on religion in my novel. I am working on a fantasy series. I hope that the first book will be available by the end of 2019. It is called Starlight and Sorcery. “Well, Joe, you do owe me one,” says my old buddy and smiles warmly. Blackness. “Some people say that the closer you are to God the more the Devil comes after you. Well, that sure is true in my case. Maybe that’s why I’m crouched down at the back of a Baptist church, where there’s a service in full swing, clutching a powerful crossbow I bought at a store with fake ID, because I’m only sixteen. I fully intend to use it; the crossbow I mean. I began to ascend the flight of steps which led to Montmartre, eager to disassociate myself from the body lying in the road below. I watched the scene from the top of the steps, afraid that I may have been spotted, although I could see no one nearby. At first the street was quiet and still, as in a time of prayer or of mourning. Then the people came running from all directions. They seemed to descend on him like vultures, their black cloaks flapping like wings, their raucous cries of alarm raking the still air. Many of them had dark eyes, I was sure of that, even at a distance, as they came running towards him through the Parisian streets. They had dark eyes that were shrewd and sharp and keen. Their crow-colored heads glistened in the sunlight. Were they here to help him or to pick his pockets for silver, like the magpies I had seen in the woods around the chateau? But it was too late to help this man. He was already on his way to Hell. They seemed surreal, like visitors from the underworld who had come to claim his soul. I really like a good mystery. 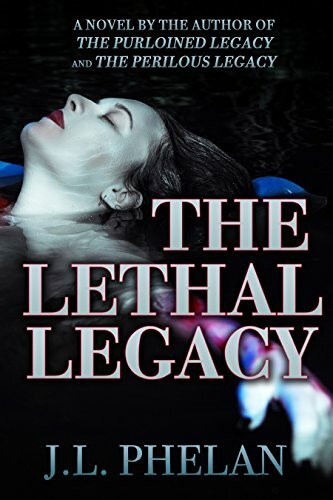 The Lethal Legacy by JL Phelan was just that. I was flipping through pages as fast as I could. That is always my highest praise. The book opens with the discovery of a death on a beach in Costa Rica in 1914. The dead woman is an heir to the Mariani Cacao Company. Her name is Briana Mariani Delaney. The story then jumps to present day to the interactions between Dr. Samantha Delaney and Karina Mariani Ortiz. They are the current heirs to the Mariani fortune. They do not know each other, but that is about to change as they try to unravel the mysteries surrounding the Mariani family. What starts as a simple curiosity to know more about family history soon becomes something else altogether. One of the main draws for this book is its varied setting. It goes back and forth between New York City, Philadelphia, Miami, Costa Rica, Geneva, Caracas, Colombia, Paris, and Bordeaux. I found the descriptions of these cities very evocative. The action also moves seamlessly between time periods from 1881 to the present. Because of the skill with which the author moves between time period and characters, the reader never gets a chance to be bored. Briana is at the heart of the book. She marries John Delaney and has 4 children. Despite the fact that she is a woman in a time when women did not take charge, she ends up largely running the Mariani family empire. As the Mariani family goes through many trials, Briana manages to keep them mostly on track. Somehow, along the way, the family loses the company. This is the mystery that Samantha and Karina end up trying to solve. Along with the help of Samantha’s husband, Brett, Karina’s husband, Martin, and Karina’s father, Richard, they all become immersed in trying to find out what really happened on that beach so long ago. Nothing is what it seems though. Adding to the intrigue, they find themselves being anonymously threatened as well. Cryptic notes telling them to quit digging are left for them. They find themselves facing very real dangers along the way. The book is very well written. It flows in a smooth and logical fashion, especially for a book with so many different time periods and locations. The author does an amazing job of keeping it all lively and interesting. The only negative thing about the book is that, very occasionally, some of the dialogue felt stilted. At times, it seemed a little too formal. That was very rare though. It was very good. Any negatives were far outweighed by the positives. The fact that I could not wait to turn the page to see what was going to happen made this book a very quick read. The book is also the third book in a series. I had not read the first two before reading this one. Reading The Lethal Legacy had me quickly adding the first two books to my “to read” list. That said, the book reads well on its own and didn’t require reading the first two to enjoy the story. 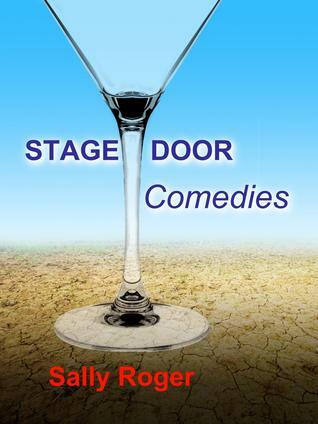 Stage Door Comedies provides a cheeky glimpse into the quirky characters surrounding theater life. What has been your experience in the theater industry and how did that bring you to writing a collection of stories? I trained as an actor in 1985 then undertook what would nowadays be called ‘an internship’ as an unpaid stage manager/lighting/sound operator on the London, England Fringe (professional Off-Off-West End). Fast-forward twenty years and I started writing plays. When I had an offer from two London Fringe theaters to premiere my first play Limehouse I knew I had broken into the business as a writer. That was my calling card. The book is based in England and Paris, with each providing a unique backdrop that flavors the stories with each local’s unique atmosphere. Was there a reason why you chose these locations as the backdrops for your stories? The story about my casting in Paris is true; I did approach theaters – including American outfits – for an English-speaking cast and did hit a brick wall. London is fortunate to have so many small-scale venues for new play tryouts and so many ‘pop-up’ comedy venues. I put Paris in Stage Door Comedies because my drama school Artistic Director studied there with Louis Jouvet at the Theatre des Champs Elysees. You could say it’s my school. In this book you show us the underbelly of the theater industry and all the weird happenings and intricacies of the individuals who call the shots. Were there any characters that you especially enjoyed writing for? Limehouse and A Suitable Lover are play-to-fiction adaptations of my first two plays which received offers of production on the London Fringe: others, I workshopped in rehearsal for conversational ‘say-ability’ (a comedic craft I honed in stand-up comedy). I directed and acted in Limehouse, an autobiographical twosome about quitting the theater, in a short run. It marked a return to a small-scale London venue. Would I direct again? No thank you, very much, at least, not for stage. In America you don’t have the British class system. What is success? Why do we pursue it? I guess as they say there is a bit of all the characters in the author of Stage Door Comedies. What was it like to be an alternative comedy monologist at Steve Strange’s Cabaret Futura? The 1980s was the era of the New Romantics and Karma Chameleon figure Boy George in the London clubs. At Cabaret Futura I did a one-person duologue playing both the comedian Jack Benny and his wife using two chairs back-to-back on the stage as props. I was also an MC at a comedy cellar near to the Royal Opera House Covent Garden. I understand Stage Door Comedies is your first published book. Are you planning to continue writing? If so, when is the next book due out? I have some more stories up my sleeve on the theme of the random nature of Fame – many are called but few are chosen. Why is one actor on the West End or Broadway while another is fated to ply their trade in a seedy, backstreet pub theatre? As Oscar winning actor Michael Caine said, it’s the years of rejection and humiliation they pay you for. For the admirers of those entering the stage door, the attraction is in what they represent. In London’s Notting Hill, a BAFTA award winner is sick and tired of people using him as a stepping-stone or step-ladder to the the big time instead of putting in ‘the hard slog’. The hustlers find that talent is not enough – it is a serious game. Sally Roger, in her recent book Stage Door Comedies, provides a cheeky glimpse into the quirky characters surrounding theater life. The book is composed of several short stories revolving around people in the theater industry. Roger obviously has a lot of experience working behind the curtain and she gives us a feel for day to day life of the actors, writers, producers, and stage hands who are always trying to keep their careers moving forward – sometimes through very strange, and comical, means. The book is based in England and Paris, with each providing a unique backdrop that flavors the stories with each local’s unique atmosphere. Characters wander through the West End of London and ring up the Globe Theater, or walk down Boulevard St Michel and get coffee at Montparnasse. But the stories are, in essence, character studies of a wide variety of entertaining people who are almost always trying to push forward obsessively in their careers. With the stories set in these world-renown metropolises known for their arts, we get the feeling that this is the way it really is. This isn’t some little town trying to put on a stage play – this is the weird process a Parisian must go through to find the perfect actor for the main role. In one of the first short stories, an over-the-hill director, tired of being used as a stepping stone by strangers looking to make it big, tries to figure out the meaning behind a bizarre waiter’s rantings – does he want something from the director or is he just crazy – as well as his long-ago connection to a middle-aged actress who has invited herself into his home. In a later story, trying to find an English-language company that will produce her play in Paris, an observant young woman visits the unusual office of a local production company, where American expats seemingly revel in the Bohemian lifestyle of Paris. Roger shows us the underbelly of the theater industry – all the weird happenings and intricacies of the individuals who call the shots, as well as those who want to ride their coattails. And for this, I give Sally Roger’s Stage Door Comedies a 4 out of 5 stars. As a collection of short stories around a singular theme, it works rather well. She obviously has quite a bit of hands-on experience in theater and therefore she is able to take a biting look at those who work in the industry. However, there’s no real continuity among the different stories, and with some being only a few pages long – I felt like she could’ve gone deeper into the mind, the actions, or pasts of the characters. 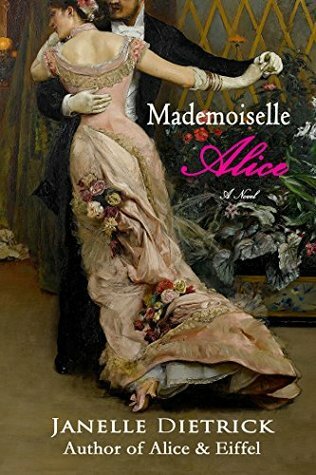 With that aside though, her writing style is quite engaging and I found myself quickly starting the next story, enjoying the quirky characters and being able to peek into an industry and all its inhabitants that most of us only see from other side.